You are here: Home / Our Animals / Chickens / Raise Araucana Chickens For BEAUTIFUL BLUE EGGS! Who doesn’t love a great blue egg laying breed like Araucana chickens? Blue eggs are one of those fun perks of owning backyard chickens….but not all blue egg layers are the same. (Even though they’re easily confused and mis-marketed). If you’ve been wondering what this super cool (and rare) breed of chicken is about, then read below to learn all about Araucanas, including their particular breed characteristics and how to spot the real deal from their closely related kin, Ameraucanas, Easter Eggers, and Cream Legbars! Araucanas are a chicken breed native to Chile and have distinctive tufts of feathers (called peduncles) that protrude near their ears. 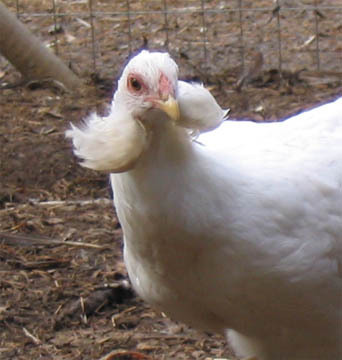 The tufts are present at birth (so if your Araucana doesn’t have them as chicks, they won’t develop them), and chickens can have no tufts, or just single tuft, or two tufts. Two tufts are considered ideal for the breed. Araucanas are rumpless (meaning they don’t have tail bones like most chicken breeds)) with small pea combs. They’re possibly the only chicken breed native to the Americas, and the name Araucana comes from the Araucania region of Chile. Araucanas are commonly confused with Ameraucanas, a breed developed in the United States in the 1970s, based on the Araucana breed, but they are two distinct breeds. The name Ameraucana is a cross between American and Araucana. 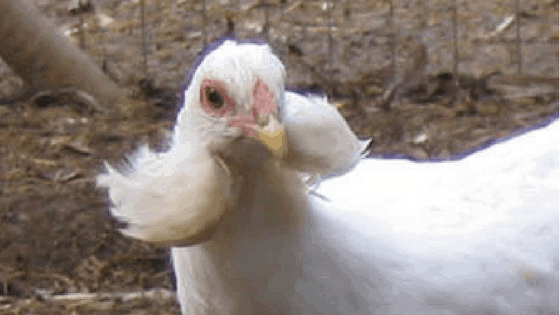 It’s important to remember that if you’re looking to raise purebred Araucanas, to buy chickens that adhere to the traditional characteristics of the breed. They should lay blue eggs, be recognized colors, exhibit the tufts, and be rumpless. You can use these characteristics to be sure the chickens you’re buying are truly the correct breed. This is Hawk, an Ameraucana. <3 She's about 2 years old, and lays blue eggs! Finally, blue eggs on the farm! We tried getting blue eggs for years, but forces of nature always worked against us….until Hawk! What color eggs have you always wanted, but just can't seem to get? Both full sized Araucana chickens and bantam breeds are recognized, and recognized color varieties in the United States include black breasted red, silver duckwing, golden duckwing, black, and white. The bantam variety also include buff as a recognized color. Got this blue egg today for the first time. Pretty sure it was Hawk who laid it, although there's two pullets about the same age I bred that are candidates, but they're olive egger crosses so most likely they would lay dark green or brown eggs. This one looks kind of like a large robin's egg. You can hatch Araucana eggs yourself (just be sure to buy fresh ones and store the hatching eggs correctly before incubating them). Raising chicks isn’t any different than raising other breeds. Araucanas are a fun chicken breed to own and despite their smaller size, they can lay nice big eggs. Not all Araucanas enjoy a lot of human attention, so it’s important to spend time with them frequently when they’re chicks and spend a lot of time feeding them treats if you want lap chickens. They don’t require special feed, are docile, and the hens don’t get aggressive during brooding. You can buy Araucanas at most major hatcheries however you should also seek a reputable breeder to ensure you’re getting true Araucanas and not Ameraucana or Easter Egger chickens. You can buy hatching eggs, baby chicks, and started chickens. For a full list of Araucana breeders, you can visit the Araucana Club of America at http://www.araucana.net/breeders/. For more information about Araucanas in the United States at Araucana Club of America. I am a new chicken momma and have two chickens I rescued about a year ago. I have a nice secure coop and chicken run for them. One is a Rhode Island Red and the other a blond bluff. I really want to get two more so I have a little flock but how can I introduce new chickens to my two hens. I don’t really want to start with chicks due to lack of experience. Any thoughts or suggestions? Love your daily reads! Thank you!